The Mark XVI Spitfires were basically standard Mk. IXs but powered by a Packard build Merlin 60 series engine. These were probably the latest and greatest of the Merlin engined Spitfires and served late in the war and on into the post war time. They are most easily recognized by the cut down rear fuselage and the 'bubble' style of canopy. Most M.XVIs also had clipped wings for low level operation and were often used in the fighter bomber role, though oddly, they were not given additional engine and pilot armor for this job. So popular were they that many saw post war service, not only with the RAF and Auxiliary Air Force, but with other nations as well, such as France, Belgium and Greece, to name a few. CMR is on a mission to provide quality kits of all the different Spitfire and Seafire variants and this kit is certainly a quantum improvement over the other Mk. XVIs that have been done in this scale by Matchbox and by Heller. In common with their Spit IX kit, you have enough optional bits to do pretty well any variation of wings/wheels/armament and so on that you can imagine. For instance, when looking at the superbly cast wings, you first wonder what the difference is in the two that are supplied. Then as you look closer, you see that one of them has the additional wheel bulges and reinforcement fairings of the later versions. For wheels, you have three sets. One is a standard cast four spoke wheel as used on several of the options. The other two are a standard wheel with a blank spoke face and a wider wheel, also with a blank spoke face. Of course, you'd use the wider wheel with the wing that has the wheel bulges. The spoke pattern will come from the superbly done Eduard color etched fret that is included. Then you'll have to decide which exhaust to use as there are two styles and also the gun armament as you can do the version that used the .50 cal in place of the two .303 ones. If that isn't enough, then you can also choose to use a one piece prop/spinner or pick the one that has separate blades and spinner. Want more? You have optional rudder pedal designs and you also have the option to install either a bomb rack or long range fuel tank on the centerline as well as the ability to put on wing racks. Two superbly done vacuformed canopies are included, both of a reasonable thickness to make it a easier to attach. Throughout, I found little in the way of molding glitches in the resin. Sure, there are a few spots, but nothing like what I find on some kits. In fact, some of the resin parts are almost hair-fine and I'm sure I'd mangle the heck out of them so having some fine wire on hand for replacements wouldn't be a bad idea. Instructions are just superb. There are four pages of nicely done b&w photos of a restored version, including some important close up pics. 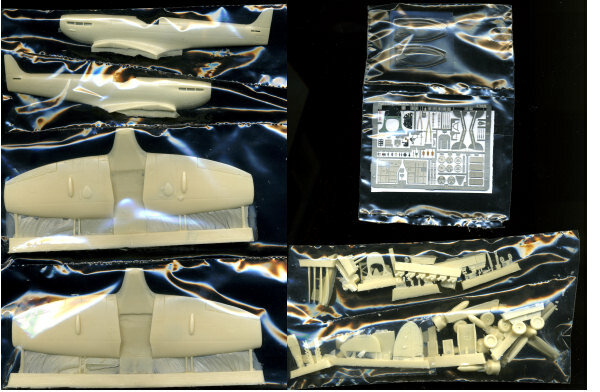 The actual construction sequences are also superbly done and point out not only the colors used for the various bits, but also what options are applicable to which aircraft. One can figure which option uses the later wing by the wheels listed. One thing that is left up to the builder is to figure out the armament used as that is the one piece of information not supplied aside from a single image of one of the box art planes. 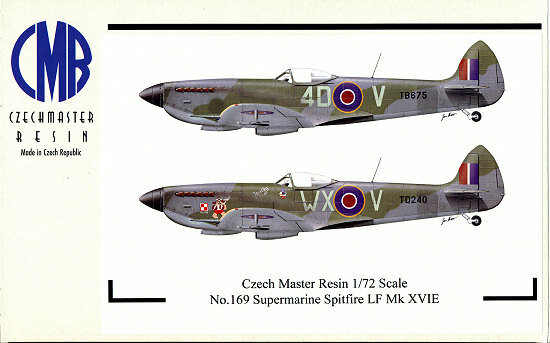 There are markings given for six different aircraft, all in the Dark Green/Ocean Grey over Medium Sea Grey camouflage that was common with spits. Three of these are with the RAF, including 302 Sq in mid 1945, 322 Sq in early 1945 and 74 Sq towards the end of the European war. In with that is 345th Free French Squadron with its French roundels, 350 Sq Belgian AF in summer of 1945 and a Greek Air Force plane from mid 1949. This latter one is the only version without the yellow leading edge ID markings, and none have fuselage bands. 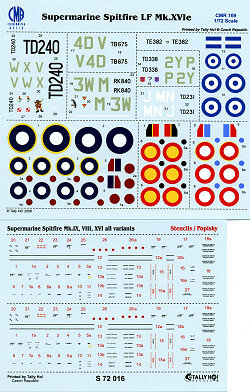 Decals are superbly printed and most of the roundels have separate centers to prevent registration problems. They are printed by Tally Ho so you know that they are a quality decal. Two full sets of stencils are provided as well as a comprehensive stencil placement guide. So there you have it. The best 1/72 Spit XVI on the market with enough options to allow you a wide range of building possibilities. All the optional bits along with the superlative instructions and decals are what make CMR one of the best in the world.